It is dark days in the sector. Funding cuts in 2010 followed by a Budget this year that is effectively another cut, combined with the effects of privatisation, has left many in the sector struggling to maintain high-quality services for very young children. Head Teacher Julie Brice from Finlayson Park Childcare spoke in support of the Joint Initiative (JI) as a way of growing collaboration and supporting transitions. She said that teachers at some centres had no non-contact time to meet and organise smooth transitions into school for children, but the JI had the potential to develop effective communities of learning. Shortly after the symposium, came more bad news. The Education Review Office released its report, Infants and Toddlers, which found only 56 percent of very young children in centres had a responsive curriculum that supported them to “become competent and confident communicators and explorers”. It follows a similar 2011 report from the Office of the Children’s Commissioner, which has been largely ignored by policymakers. A government undertaking to drop the teacher: child ratio for under-twoyear- olds from 1:5 to 1:4 has fallen by the wayside. Like many community services, kindergartens have been particularly hard hit by funding cuts and the aggressive marketing of corporate providers. Despite this, the New Zealand Kindergartens Association has maintained 100% trained and qualified staffing. Most kindergartens, though, have been restructured. Quick action by NZEI members employed on the Early Childhood Education Collective Agreement has won them a better offer. Employers, faced with a funding cut, had wanted a 0% pay offer with clawbacks on conditions, including increased contact hours and less sick leave. But a quick-response action by members made it very clear this was unacceptable, and a better offer was made. Other educators, who are not organised, have not been so lucky. New operators of some centres have made hard-nosed cuts to staff conditions – despite the research being clear that quality teachers, with good terms and conditions of employment, are critical to the provision of high quality ECE. The Infants and Toddlers report notes that services which were responsive to very young children had “a highly reflective culture where teachers inquired and regularly reflected on their teaching practice”: a very high ask for those teachers working 38 hours of contact time a week, with high ratios, and a mountain of paperwork to complete. 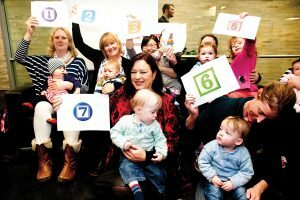 26 for Babies – as part of this campaign, parents and babies went to Parliament in August to advocate for 26 weeks’ paid parental leave. A coalition of groups, including NZEI members, Plunket, Unicef, Playcentre, the Council of Trade Unions and others, make up 26 for Babies. Under pressure last year, the government announced an increase to 18 weeks of paid leave in the Budget. Then Sue Moroney’s private member’s bill, which would give 26 weeks, was drawn from a ballot. Given the bill’s obvious popularity, the government moved to offer 26 weeks’ paid leave for multiple births and for some children with special needs. Onward!. Join your local ECE network. Ring 0800 693 443 to find out more. Invite non-members to your local network – we are stronger together. Advocate publicly for quality ECE – on social media, at meetings, with families, and in the community.